The team of Sammohanam including Sudheer Babu, Indraganti Mohanakrishna and Sivalenka Krishna Prasad met Megastar Chiranjeevi to thank him for releasing the teaser. A children’s book illustrator, who is disdainful towards the movie world, finds himself in a bit of a situation when he falls in love with a superstar actress. This forms the crux of Sammohanam, the recent breezy entertainer that released on Friday. Sudheer Babu, Aditi Rao Hydari, Senior Naresh, Rahul Ramakrishna, Pavitra Lokesh, Harshini and a lot more notable actors are present in this hilarious yet sensible love story directed by Indraganti Mohanakrishna. The film is receiving a positive response from the audience and critics alike. It has all been praises and applauds for every character in the film since the release and has unanimously been declared a blockbuster. Right from the announcement of the title, the comedy-romantic drama created interest amongst the audience. The teaser was released by Megastar Chiranjeevi and the trailer was released by Superstar Krishna on his birthday. The pre-release event was graced by Mahesh Babu and set the tone right for the release of the film. The pre-release buzz only raised high expectations among the audience. 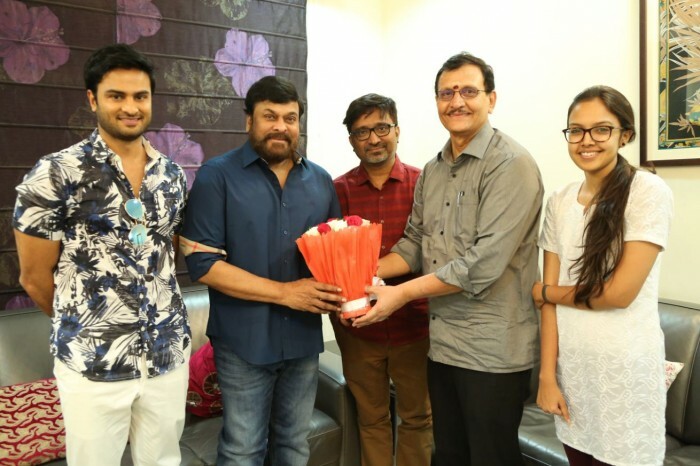 Now that the film has been well received by the audience, the team of Sammohanam including Sudheer Babu, Indraganti Mohanakrishna and Sivalenka Krishna Prasad met Megastar Chiranjeevi to thank him for releasing the teaser. He also released the book “Thaaralu Digi Vacchina Vela” which is a part of the movie Sammohanam. It is the book Sudheer’s character in the film illustrates and publishes in the climax. It was indeed wonderful of Chiranjeevi to launch the book and congratulate the team of Sammohanam for their success. Written and directed by National Award-winning filmmaker Mohana Krishna Indraganti, the cast also includes Naresh, Tanikella Bharani, Pavithra Lokesh, Rahul Ramakrishna and Nandu in pivotal roles. The film has music by Vivek Sagar and will be bankrolled by Sivalenka Krishna Prasad. PG Vinda is the cinematographer.